URGENT--We have been helping the family that rescued Chablis, but now we fear that the kitty might be in danger. Chablis has become anxious and the family say that they can not cope with her anymore and will probably have her euthanized. 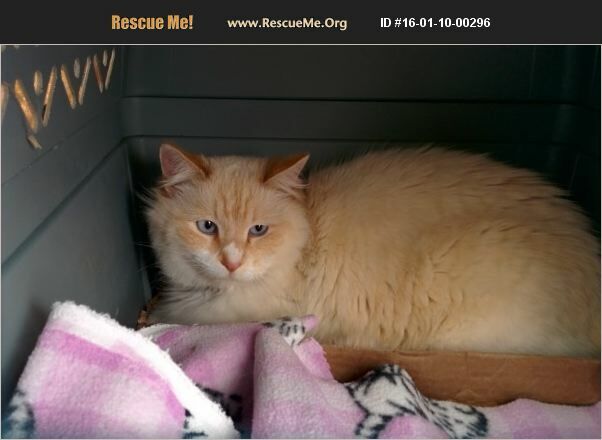 This lovely Flame Point Siamese girl is 3-4 years old. If anyone can foster or adopt her, now is the time. Chablis did not come from a feral situation. She came from an overcrowded household, so might do well with another cat. All her vet work is done. Chablis needs a cat savvy person who is willing to work with her and we are certain that with patience, she can learn to trust again. We are hoping to facilitate the foster/adoption. If you are interested in giving Chablis an INDOOR home in the Northern or Eastern San Francisco Bay Area, please call Jane ASAP.